In Part 1 of this series I laid out the prerequisites. Now we’ll get into how to turn the Kinect into a tracking system for the cannon. As I mentioned in Part 1, one of the pieces to this puzzle was already written for us – a .NET layer around the launcher. This layer was provided by Chris Smith in his Being an Evil Genius with F# and .NET post. He links to this source code at the very end of the post, and included several projects. We ended up using the RocketLib\RocketLauncher_v0.5.csproj project. Where “Me._Launcher” was an object of type RocketLib.RocketLauncher. The numbers being passed to the “Move” commands are the number of times to move the launcher turrent. The unit of “time” or “step” (as we came to refer to it) seemed to translate into a little less than half a degree of rotation (either left/right or up/down). Armed with this knowledge (see what I did there? ), we were able to whip together a little WPF interface that had five buttons on it – Up, Down, Left, Right, and Fire – that controlled the launcher manually. That became the “Manual” mode. The “Auto-track” mode, where the Kinect would control the launcher, would come next. Now we started going through the Kinect SDK Quickstart video tutorials, produced by Microsoft and hosted by Dan Fernandez. To begin, we wanted to get to the raw position data (X, Y, and Z) from the camera. We ended up compressing the first four tutorials (“Installing and Using the Kinect Sensor”, “Setting up the Development Environment”, “Skeletal Tracking”, and “Camera Fundamentals”) into a Friday to get ramped up as quickly as possible. In “Skeletal Tracking Fundamentals”, Dan explains that the Kinect tracks skeletons, not entire bodies. Each skeleton has 20 different joints, such as palms, elbow, head, shoulders, etc. We decided to select the “ShoulderCenter” joint as our target. Next, we added labels for the X, Y, and Z positions of the ShoulderCenter joint to the app, and then started moving around the room in front of the Kinect, seeing how the values changed. The values are given in meters, with X and Y being 0 when you’re directly in front of the depth camera. These values are updated in the SkeletonFrameReady event. Now, the fun could really begin. We decided to focus on left/right movement of our target, so the Y value is not used in the app at all. We also decided that since the launcher had a real physical limitation as to how fast it could move, we couldn’t give it too many commands at a time. The Kinect sends data 30 times a second, so we decided to sample the data twice a second (every 15 frames). Our first attempt at this was very complicated and clunky, and didn’t work well unless you were at a magical distance from the Kinect (basically we threw enough magic numbers into the equation until it worked for that one distance). We really ran into problems when we tried to extend that to work for any depth. It was Doug that hit upon the idea of calculating the angle to turn the launcher as the arc tangent of X/Z as opposed to what we had been doing (the number of steps). That did two things for us – first, the angle approach was correctly taking the depth information (Z measurement) into account, and second, it meant we only had to store the last known position of the launcher (measured as a number of steps, either positive or negative, with 0 being straight ahead). If we knew the last position, and we knew where we had to move to, we could swivel the launcher accordingly. With this logic in place, the tracking became fairly good, regardless of the distance between the target and the Kinect. Since there really wasn’t any feedback that the launcher could give us about it’s current position, this logic make a couple of major assumptions about the world. First, the Kinect and the launcher have to be pointed straight ahead to begin with, and second, the Kinect needs to remain pointing ahead. We uncovered the first assumption when the launcher stopped responding to commands to move right. We could move it to the left, but not to the right. We fired up the application that comes with it, and discovered a “Reset” button that caused the launcher to swivel all the way to one side, then to a “center” point. This center point was actually denoted by a raised arrow on the launcher’s base – something I had not seen up to this point. After we reset it, it would move left and right just fine. As it turns out, the launcher can’t move 360 degrees indefinitely – it has definite bounds. The reset function moved it back to center to maximize the left/right motion. After we discovered that, I would jump out to that app to reset the launcher, and then I had to shut it down again before I could use ours (two apps couldn’t send commands to the launcher – in fact we got runtime errors if we tried to run both apps at the same time). After a while that got old, so we included a reset of our own. Since we knew the launcher’s current position, we’d just move in the opposite direction that amount. We added a Reset button to our own app, and also called the same method when the app was put back to Manual tracking and when it was shut down. We uncovered the second assumption in a rather amusing way. During one of our tests we noticed the cannon was constantly aiming off to Doug’s (our target at the time) right. He could move left or right, but the launcher was always off. He happened to look up and noticed that the Kinect had been bumped, so it wasn’t pointing directly ahead any more. As a result, the camera was looking off to one side and all of its commands were off. After that, we were much more careful about checking the Kinect’s alignment, and not bumping it. Early on we had thought up a “fun” piece of icing on this electronic cake. What if we took the video image from the camera, and superimposed crosshairs on it? We could literally float an image with a transparent background over the image control on the form. If we could get the scaling right, it could track on top of the user’s ShoulderCenter joint. And we did. This is turned on using the “Just for Mike” button at the bottom of the app. During the agency meeting demo, I had walked through the basic tracking, using Mike (our President) as the target, and explained about the video and depth images. Then – very dramatically – I “noticed” the screen and turned to Doug (who was running the computer) – “uh, Doug? I think we’re missing something.” At which point he hit the button to add the cross hairs to the video image. “There we go! That’s better.” Mike got a good laugh out of it, as did most of the rest of the audience. Fun? Check! Beyond the fun, though, I thought it was cool that we could merge the video and depth information to such great effect. Between having the launcher track you, and seeing the cross hairs on your chest – it’s downright eerie. So, by this point, we had launcher tracking, both video and depth images refreshing 30 times a second, and crosshairs. And everything was running on the same thread. Yeah. We now had some performance issues to solve. When the launcher moved at all, and especially when it fired (which took 2-3 seconds to power up and release), the images would completely freeze, waiting for the launcher to complete. The easy solution? Duh! Just put the launcher and the image updates on their own threads. Um, yeah. That turned out to be easier said than done. We’ll cover the multi-threading solution, as well as the speech recognition features in Part 3. Those two topics turn out to be intertwined. Update: Full source code for this solution can be found in the “KinectMissileLauncher.zip” archive here: http://tinyurl.com/MarkGilbertSource. On some Friday back in late June, he mentioned that Microsoft had released a Beta SDK for the Kinect just the week before. He asserted “We need to do something with it. I have a Kinect I can bring in.” By “do something with it” he meant in the Friday lunch sessions we’d been holding for a year called “Sandbox”. Sandbox was where a small group of us got together to work with something we didn’t normally get to use during our day jobs. We tried to keep it light and fluffy, and the Kinect fit both to a T.
Over that next weekend, I mulled over what we could do with the Kinect. What would be a good enough demonstration of this electronic marvel? And then it hit me – Joel (another Sandbox participant) had a USB powered foam-missile launcher (like the one pictured here: http://www.amazon.com/Computer-Controlled-Foam-Missile-Launcher/dp/B00100K5RM/ref=pd_sim_t_3). Now we’re talking! Microsoft had released a series of tutorials for the SDK, and a .NET interface to the launcher that Chris Smith used for his “evil genius” post. Chris attributes the original code for this wrapper to Matt Ellis. We decided that the Kinect would feed commands to the launcher telling it where to aim, and we’d use the speech recognition abilities of the Kinect to let the person in the cross-hairs say the word “fire” to send off a missile. And so began a series of Fridays where we hacked together an app that turned the Kinect into a target-tracking system for the launcher. We thought we had the hard stuff already done for us – we simply needed to write something that would connect A to B. But, as any good project should be, we found the easy parts weren’t so easy, and were pushed and prodded into learning something new. This is the first of a three-part series describing our solution. First, our laptop started with Visual Studio 2010 Professional, but in the quickstart tutorials, Dan (Fernandez) mentions that he’s working with the Express version. The sample application that comes with the launcher. This includes the drivers for the launcher itself, USBHID.dll. The .NET wrapper provided by Matt Ellis will poke into the OpenHID method to send commands to the launcher. The DirectX End-User Runtime. This is required by the DirectX SDK, and is available from here. This installer will need to be run as an Administrator (on Windows 7, anyway), and I had to do a manual restart of the machine after it finished. The installer will not prompt you to do this, but the DirectX SDK (the next step) wouldn’t install correctly until I did. The latest DirectX SDK. This is a very large install – 570 MB – available from http://www.microsoft.com/download/en/details.aspx?displaylang=en&id=6812. I had to make sure nothing else was running when I installed this, and had to install it as an Administrator. The Kinect SDK itself, available from http://research.microsoft.com/en-us/um/redmond/projects/kinectsdk/. The Coding4Fun Kinect Library available from http://c4fkinect.codeplex.com. This is not strictly required, but contains a couple of extension methods that simplify translating the Kinect camera data into images. The Microsoft Speech Platform SDK, available from here: http://www.microsoft.com/download/en/details.aspx?displaylang=en&id=14373. In particular, I downloaded the x86\MicrosoftSpeechPlatformSDK.msi installer. The Microsoft Speech Platform Server Runtime (v10.2), available from here: http://www.microsoft.com/download/en/details.aspx?id=10208. In particular, I downloaded the x86\SpeechPlatformRuntime.msi installer. The Kinect Language Pack for en-us, available from here: http://go.microsoft.com/fwlink/?LinkId=220942. In Part 2, I’ll walk through controlling the launcher manually using Ellis’ class, and then our first pass at controlling the launcher using the data coming off of the Kinect. In Part 3, I’ll go through the threading that we discovered we needed in order to make the application perform better, and why we ended up converting the entire application to C#. On my most recent MVC project, I hit a weird snag when it came to passing a variable by reference in C#. I had a class that descended from System.Web.Mvc.Controller, and I was trying to pass it to a method that took a reference to System.Web.Mvc.Controller (not my descendent class). This resulted in compile-time errors (which I’ll show shortly). This alone wouldn’t result in a blog post, except that the exact same thing in VB works fine. I wouldn’t say I was "missing" it, Bob. I then cracked open the two executables in JustDecompile to see what these two boiled down to. As it turns out, the key piece of logic – the call to UpdateName – is identical whether I use the working VB sample, or the working C# sample. So, for better or worse, the VB environment is simply doing more for me than the C# environment. It knew that I was trying to pass a descendent object, and casted it for me under the covers. The full source code for this sample can be found in the PassByRef.zip archive on my SkyDrive: http://tinyurl.com/MarkGilbertSource. The solution requires Visual Studio 2010, but this works the same way with Visual Studio 2008 (which is what we wrote the MVC application in originally, and where I first saw this behavior). For the C# application, I’ve included all four attempts as complete copies of the Main() routine. To try one, simply uncomment it, and comment out the others. No more Windows XP for Mark. I say that with at least a tear of sorrow – XP was a champion operating system for me for over 7 years. As of a couple of weeks ago, my primary workstation at Biggs was replaced, and that meant moving from Windows XP to Windows 7. I won’t go into all of the details as to why I was still using Windows XP in 2011, but a large part of it has to do with the issues I’m going to describe here. This issues really center around two things – the Oracle Data Provider (ODP) and Windows User Access Control (UAC). The issues with ODP started right at the beginning, with the installer itself. When I build an application that will go against Oracle, I have to use the Oracle 10.2 client (since that’s what the customer is using). When I first tried to run the installer for the 10.2 client, it died saying that it would only support through Windows version 6. So, I had to set the compatibility to Windows XP SP3 (right click on the .exe and go to properties, then go to the Compatibility tab). That got me past the initial check, but the install failed later in the process. I then tried restarting the installer as an Administrator (still with Windows XP compatibility enabled). It got further this time, but not quite to the end. The installer was now failing at the 98% mark because it was trying to register some files using C:\Program Files\Microsoft Visual Studio 8\SDK\v2.0\Bin\Gacutil.exe. That folder existed on my machine, but not that file. How nice that the developer who put the Oracle installer together didn’t include something that could register things with the GAC, and furthermore assumed that I would have VS 2005 (aka Visual Studio 8 ) on my machine? I checked my home machine (which had Visual Studio 2005 on it at one point) and found that I had that file, so I copied Gacutil.exe and Gacutil.exe.config from my home machine to my work machine. This time, the installer finished successfully. (I considered looking for Gacutil.exe elsewhere on my machine and just copying it into the expected folder, but since this worked I didn’t bother going down that route.) Yay for me. When I tried to use ODP, however (e.g., running a site in Debug mode on my machine, or running a test through NUnit that hit the database), it failed with a very generic Oracle error (something to the effect of "Oracle error has occurred"). Through trial and error, I found if I ran THOSE applications as an Administrator, the connections to Oracle would work fine. Let me be clear. I wasn’t trying to run Oracle locally – I was trying to connect to our development Oracle instance from my workstation. How were the connections to our development SQL Server instance working? Yeah, those worked fine on my machine whether I ran Visual Studio and NUnit as an Administrator or not. How about PL/SQL Developer? Couldn’t connect to Oracle unless it was run as an Administrator. How about SQL Server Management Studio? Worked fine as Administrator or not. My domain account is an administrator of my local machine, but apparently that isn’t enough. I found that if I completely disabled UAC, however, these would run correctly. I was really tempted to just disable UAC altogether – which does work, by the way – but I really wanted to find a way to work within the system, which boiled down to running Visual Studio, NUnit, and PL/SQL Developer as an Administrator, every time. Running these apps as Administrator was a bit of a pain, however, mostly because I kept forgetting that I needed to do it. So, I set out to try to smooth out the process of launching applications under UAC. I religiously use an application launcher called SlickRun. I hit Windows-Q to bring up the SlickRun command line, type in a customized keyword, or "MagicWord", for the application, site, or command I want to run, and hit Enter. So, for example, to bring up PL/SQL Developer I would hit Windows-Q, type in "oracle", and hit Enter. SlickRun has an option that can be checked per MagicWord called "Prompt for user-account (aka elevate to admin)". I turned that on for PL/SQL Developer, so when I started it up it would throw up the UAC prompt. Once I hit "Yes" (or Shift-Tab then Space to click the "Yes" button without my fingers leaving the keyboard) PL/SQL Developer would open as an Administrator. I did the same thing for Textpad and NUnit. My next challenge was Visual Studio. The normal way I open a solution in VS is to browse to the .sln file on my file system and double-click it. Click "Run this program as an administrator"
Once I did that, however, double-clicking the SLN file did nothing. That allows the Launcher to run as an Administrator, so it can now launch Devenv.exe as an Administrator. Why in the world is any of this necessary? Why are local admin rights not sufficient for running a site against Oracle on my local machine? Alternatively, do connections to SQL Server from my local machine require similarly inflated privileges, but because it’s a Microsoft data connector on a Microsoft operating system, it just works more smoothly? Even after all of this, though, I don’t regret moving to Windows 7. There are a lot of things I like about it, but there needs to be some additional grey matter applied to the concept of application security. My most recent project held most of the information tied to the current user’s session in cookies. I needed to be able to pass information among the client logic, the server logic, and the Flash application hosted on the site. Cookies seemed to be the common and easiest medium for that. For the most part, that architectural decision turned out to be a good one, with a couple of exceptions. The exceptions are the topic of this blog post and – of course – most of the issues I’ll describe were simply me learning how the world worked. Flash was hosted on the home page of the site, and we wanted it to display a special background image when the user visited the home page in a certain way. If you visited the default home page, “/Home.aspx/Index”, Client would set a cookie called “background” that contained a default value, but only if the “background” cookie wasn’t already set by the Server. Whatever value ended up in the cookie, Flash would see it and swap in the corresponding background image. If, however, you visited one of the “themed” home pages, such as "/Home.aspx/Paper”, then Server would set the “background” cookie, thus preempting Client. Once this cookie was set, as long as the user didn’t browse to a different themed home page, this cookie would persist during the session, and every subsequent request to the home page would have that background. At least, that was the theory. During some of our initial testing, we found that Flash was having problems displaying the correct background every time. We eventually tracked it down to the value of the “background” cookie. I ran the site through Visual Studio so I could step through the Server logic to see what was happening. On the first request to /Home.aspx/Paper, the Server logic would set the “background” cookie in the Response. The view would then render. Then, on the next post back a second “background” cookie would appear in Request.Cookies. 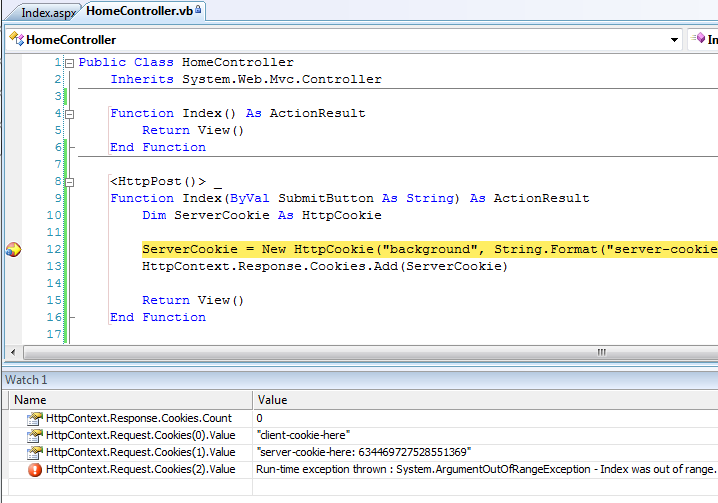 ASP.NET includes two intrinsic cookie collections. 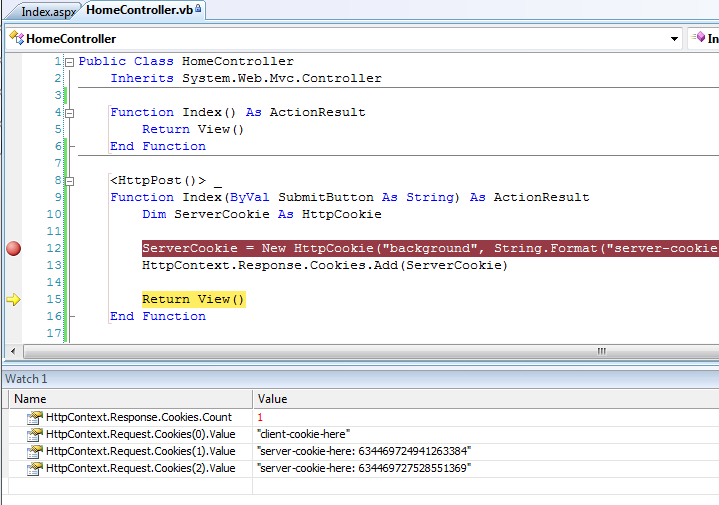 The collection accessed through the Cookies collection of HttpRequest contains cookies transmitted by the client to the server in the Cookie header. The collection accessed through the Cookies collection of HttpResponse contains new cookies created on the server and transmitted to the client in the Set-Cookie header. After you add a cookie by using the HttpResponse.Cookies collection, the cookie is immediately available in the HttpRequest.Cookies collection, even if the response has not been sent to the client. Ok, that at least explains why cookies were showing up in both Response.Cookies and Request.Cookies. With that past me, I turned my attention to why Request.Cookies still had two – one set by Client and one set by Server. Through a lot more experimentation, I found that my Server cookies were, in fact, being overwritten, but in a round-about way. Ignore the third and fourth watches – those will come into play later. Notice that there are zero Response cookies set so far, and the only Request cookie is from the Client. 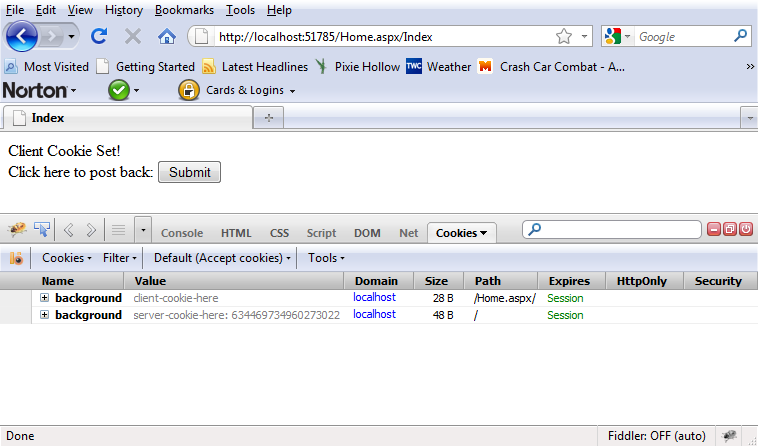 The Client cookie was set when the GET version of Index was executed. So far so good. Both the Response and Request collections get the new Server cookie. My Response collection looks fine. My Request collection, however, is just getting out of hand. 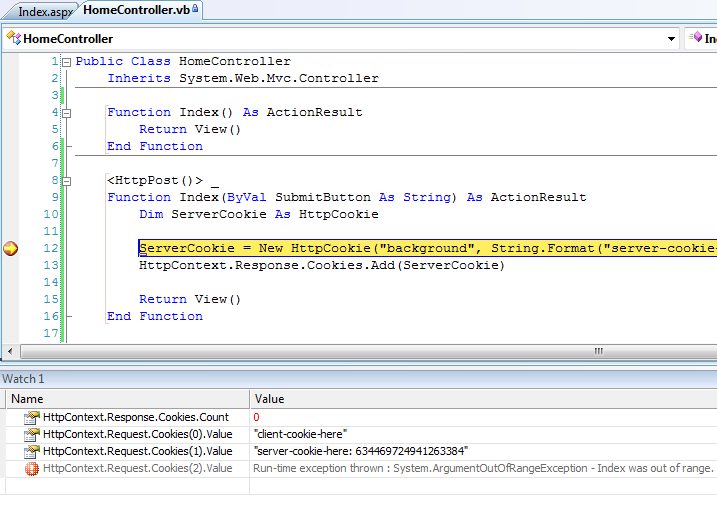 Not only do I have both the Client and the Server cookies, I have TWO Server cookies! A couple of things to notice here. The first is that my Request.Cookies collection is back down to 2 cookies – one Client and one Server. Awesome! Also notice that the Server cookie returned has the later of the two timestamps shown for the Server cookies in the previous screenshot. In other words, my Server logic is, in fact, overwriting the Server cookies. Doubly-awesome! Ok, so one puzzle solved. Now I just have to figure out why my Server cookies are still not overwriting the Client one. Nuts. Both cookies have the same path. Well, it was a good try. I examined the other properties on the two cookies, and couldn’t find anything else that should have been differentiating them. By this point, I had been falling down this rabbit hole for over a day. 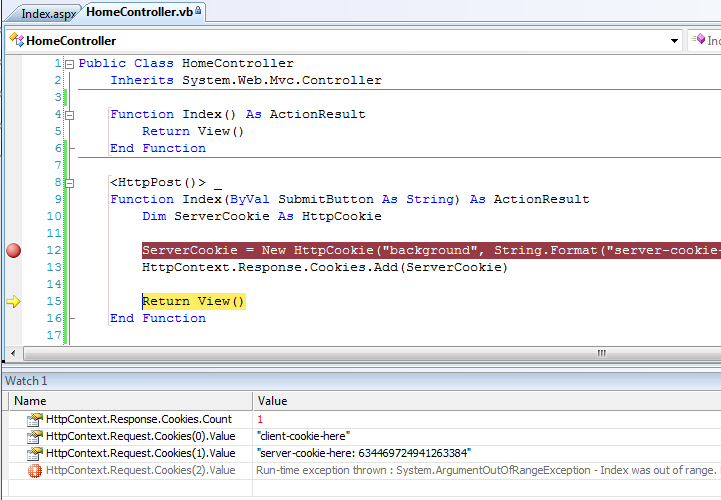 While I had made some clear progress at understanding how cookies were handled, I still hadn’t solved the core issue. I decided to get another pair of eyes on this issue. My colleague, Ron, obliged. You’ve GOT to be kidding me. The Path properties WERE different after all. 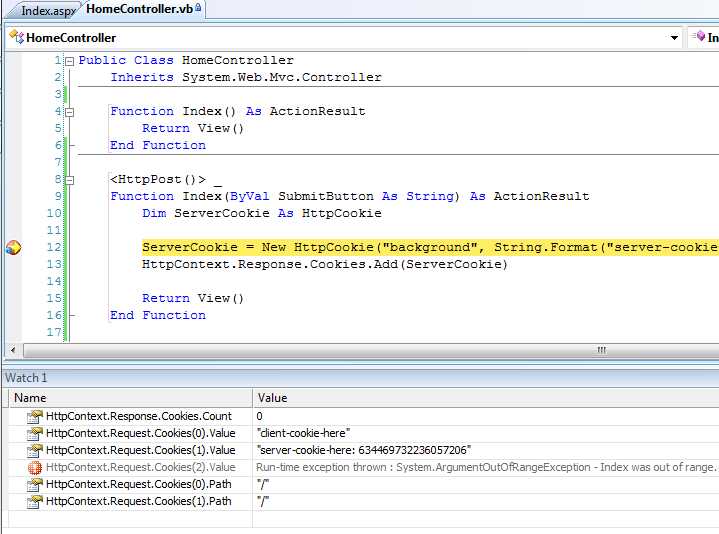 Visual Studio wasn’t reporting the Client cookie’s Path correctly! Notice the addition of “path=/” to the end of the c_value variable. Once I did that, my Client and Server “background” cookies could now be viewed as one and the same. That allowed them to overwrite, and preempt each other. 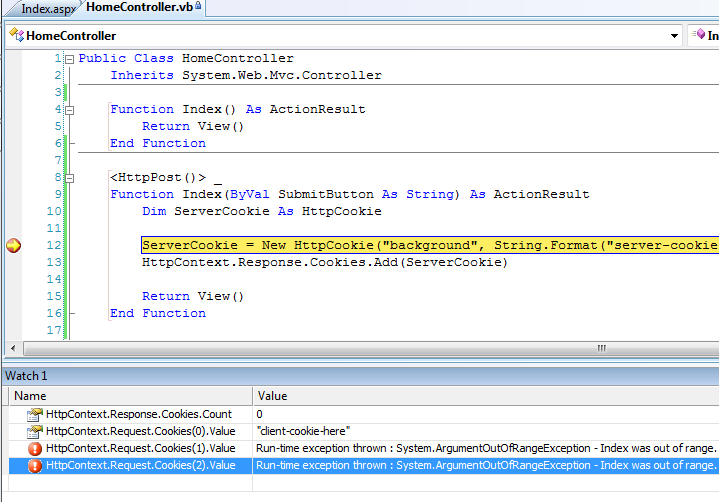 Beyond learning how the Request and Response cookie collections work, I learned a couple of valuable lessons here, both regarding the Visual Studio debugger. The first is that is that a round-trip to the browser is apparently required for the debugger to de-dup the list of cookies shown in the Request.Cookies collection. That was terribly confusing for me. I was expecting to see the new Server cookie simply overwrite the old one – without having to go down to the browser to do it. The other lesson learned is that I can’t trust the debugger to accurately report the “Path” property for cookies (whether it can’t report the correct Path for some reason, or it is simply a bug, it’s confusing either way). I need to use a client-side tool like FireCookie to do that. In the previous episode of “Mark and the Chartreuse-Field Project”, Mark was working to get site-wide error reporting up and running. Today, Mark tackles model-level error reporting. Let’s tune in and see how he’s doing. So, if the error is getting added to the ModelState correctly, then why isn’t it showing up? The answer came in two parts. First, I was passing a “True” to Html.ValidationSummary. This was configuring the control to not display messages that were tied to a field (the actual parameter name here is “excludePropertyErrors”). My asterisk was being treated like another field name – one that didn’t match a field-level validation control – and was therefore being excluded by the validation summary control. Second, a post from the ASP.NET forums (http://forums.asp.net/p/1628537/4193163.aspx) suggested that displaying model-level errors were not possible in MVC 2, and apparently were in MVC 3. Upgrading wasn’t an option for me, so I needed to find another way. And voila! Model-level errors in MVC 2! One of the main reasons I maintain a technical blog is to document how I did something, because inevitably I’ll need to do that same thing three more times in my career, but those three times will be so far apart in time that I’ll forget what I did. Having said that, I maintain no illusions that I write about anything novel here – please assume this is just me being slow, and that I’m giddy about figuring out what the rest of you already knew. For today’s episode, I’m writing about custom paging with DataGrids. I’ll admit it. I rushed. I needed to build an admin tool that showed a list of items to be approved or rejected, and I decided to just slam a collection into a DataGrid, add a few buttons, and call it a day. On the off-chance that we got a lot of submissions, I turned on the DataGrid’s default paging so the admin wouldn’t have to scroll through hundreds of entries at a time on one long page. Ironically, it was the fact that we got hundreds of entries that caused the issue. The issue was that the admin tool timed out before showing even the first page. Because I used the grid’s built-in paging controls, it was attempting to bring back the ENTIRE data set every time, but only show one slice of that data (the page requested). It worked great when I had 15 records in my development database. Didn’t work out so well when I had 800 (part of each record was a BLOB, so while 800 seems like a small number, there was actually a lot of bytes coming back). In my rush to get the admin tool out the door, my shortcut turned into a paper cut – small, seemingly innocuous, and very painful. The solution was to modify the grid and the stored procedure to only bring back and attempt to display one page of records at a time. The first part was to modify the stored procedure and the .NET code that invokes it to take parameters for the page requested and the number of records to include on each page. That was relatively straightforward. The second part was to wire up the DataGrid control to call this stored procedure with the correct page each time. That required a little more work. I first handled the grid’s PageIndexChanged event, and called my “Load” method using e.NewPageIndex, the 0-indexed page of data being requested. The “Load” method would then set the DataGrid.CurrentPageIndex property to that value. After that I would call my stored procedure and bind the results to the DataGrid as before. At this point, the grid displayed with a number “1” in the corner as I had intended and the first page of results was showing, but even my development database had more than one page of data. Where were the other page numbers? After some reading, especially this post, I found that I needed to set the DataGrid’s VirtualItemCount property to the total number of items in the result set. That combined with the DataGrid’s PageSize property (which I had already set), it could properly render all the page numbers. Except that clicking on any of them merely returned the first page of data again. After more reading, I found that there was another property on the DataGrid that needed to be turned on. I had set the AllowPaging property to True, but I found that I also needed to set the AllowCustomPaging property to True. Once I did that, the page numbers mapped to the proper page of data. And a cooling salve was applied to the paper cut. While I had specific reasons for pushing the site in this direction, my decision to go this route was seriously called into question almost right out of the gate. I was trying to configure ELMAH to work with MVC, and it was bothering me how difficult it was becoming. Honestly, I think most of the difficulty was getting used to the MVC mindset again. My first and last only experience with ASP.NET MVC was building the Microsoft Developers of Southwest Michigan user’s group site, http://DevMI.com, but that was a year and a half ago. I then tried to test it by throwing a dummy exception in the home page’s controller. The generic 500 page came up, not my custom one. Both of these posts mention the HandleError attribute that can be applied to both a controller class and the methods within. What seemed to be happening was that this was preventing my custom error page (as defined in the web.config) from rendering. I had started with the basic out-of-the-box MVC 2 template site, and then started trimming back what I didn’t need. After reading these articles, I took a look at the HomeController class, and sure enough the HandleError attribute was applied. I removed it and hit the home page again. My custom “Error” view finally rendered. Now that that was working, I dropped the other ELMAH configuration pieces in place in the web.config. These mostly worked as they had in the past – I was able to see the custom error page, ELMAH was recording the exception on the file system, and it was generating an email to me with the exception – great! We’re making progress! 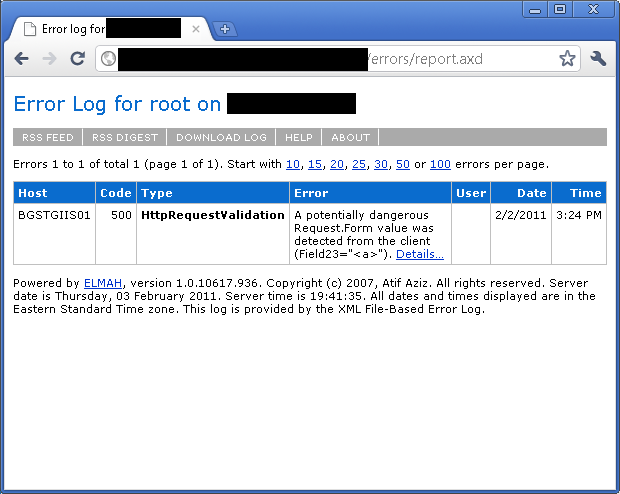 There was just one more piece to my standard ELMAH implementation – the error report page. With every site that I use ELMAH on, I configure the /errors/report.axd virtual page to show the list of the ELMAH exceptions that have happened on that site. This allows me to go back through the Production logs to get a better feel for recurring issues. Since Production has multiple, load-balanced servers, having a separate error report that is tied to each server allows me to identify problems that are occurring on only that web server. The catch all says “anything that doesn’t match one of the above rules should render the 404 page”. And that was exactly what I was getting. The search for report.axd stopped there because it finally matched a routing rule, and therefore the request never made it to ELMAH. I tried the page again, and this time it worked! Well, sort of. The page rendered, but not any of the usual styling. I fired up Fiddler and hit the page again. I saw that requests for both errors/report.axd and errors/report.axd/stylesheet. Aha! I bet my rule doesn’t cover that. I looked at the original .IgnoreRoute rule, and saw that the were using (*pathInfo) in the definition. That looked a lot like a wildcard, so I tried adding a variant of my first rule to the list. Hey, look at that! The page renders beautifully now! Ok, now it was time to tempt fate. I wondered if the first rule was actually a special case of the second, and if the second would actually cover everything. I commented the first rule out and tried the page again. Success! The page still looks and functions beautifully. I removed the first rule and committed everything. My initial doubts were laid to rest. Onward! Subject: Reflector free version being discontinued? Earlier today I came across an announcement on the RedGate .NET Reflector landing page regarding the future of the product. Your decision to make version 7 a paid-product is a little disappointing, but not really surprising. You are, after all, a commercial enterprise, and I understand the need to charge for the products and services you provide – even if they were previously made available to the development community free of charge. Q: How much longer will I be able to obtain and use a free version of .NET Reflector? A: A free version will be available for download until the release of Version 7, scheduled for early March. The free version will continue working until May 30, 2011. Do I understand this correctly? If I were to fire up Reflector on May 31, and receive the "a new version is available, would you like to update now?" message, and I respond "No", will the tool continue to function? Or will it say "sorry, you must upgrade to version 7 to continue using this tool", which will require a minimum payment of $35? I look forward to your clarifying response. Terribly disappointing. I responded to Anthony, and very pointedly argued how terrible an idea to time-bomb version 6 was, and what two possible solutions would be – remove the time-bomb from version 6 and/or create a stripped-down, free edition of version 7. The RedGate forums have been hopping since the announcement, and there are a lot of people very upset about this. It’s also interesting that in all of the feedback, there has been very little response by RedGate, at least on the forums. My hope is that the folks at RedGate HQ are reviewing this feedback and are formulating a change to their approach. One of my current projects involves handling images generated from within Flash. Early on, I made an architectural decision to store those images in the database rather than on the file system of the web server. Since I was interfacing with Flash, I wrote a series of FluorineFX Web services to save and retrieve the images and associated data. Data from Flash would come in as a FluorineFx.AMF3.ByteArray and get converted to a .NET Byte array for storage; retrieval would reverse the process. Everything was just peachy-keen until I had to display those same images in a .NET DataGrid. My business layer already had the functionality to return galleries of images in one fell swoop. All I was trying to do was bind that output to the DataGrid, but I wasn’t sure how to bind a Byte array to something that would allow it to render as an image in the browser. Doing some searching on the internets turned up a very interesting mechanism with the <img /> tag. Normally, this tag’s “src” attribute needed to point to a URL of some sort. If nothing else worked, I could always create a handler (GetImage.ashx, or something similar) that would take an ID of the image I wanted to show, retrieve it from the database, and then write it out to the browser. This handler would become the URL for “src”. But that would mean the page would have to make multiple requests to the web server, one for each image. I already had all of the image data pulled together, and wanted a more direct way to render them – as images – to the page. The “data:” directive, which tells the browser that there is a string of bytes coming down, rather than a URI. The MIME type for the image to be displayed, followed by a semi-colon. I store this alongside the image data in the database, so this was just another field in my business object to be bound here. The keyword “base64”, followed by a comma and the string of bytes itself. The latter is the Byte array returned from the database, converted to a Base64 String. The feature goes by the more formal name of “data URI”, and has been supported by most browsers for a good long time (see this forum post from 2004, which is what got me going down this road to begin with: http://www.velocityreviews.com/forums/t89692-how-to-display-in-memory-image.html). I say “most” because Internet Explorer prior to version 8 does not support this at all. Version 8 supports it in a limited way – only certain tags, and a limit of 32k for the file size (see http://www.websiteoptimization.com/speed/tweak/inline-images/ or http://en.wikipedia.org/wiki/Data_URI_scheme). Internet Explorer 9 reportedly removes many of those restrictions (again, see http://en.wikipedia.org/wiki/Data_URI_scheme). The advantage here is that I don’t have to write a handler page just to retrieve the image – I can directly drop these into the DataGrid. That means fewer requests to the server to get the images down to the browser. However, one of the disadvantages is that the images can no longer be cached by the browser – the image data has to be sent down with every request. That didn’t really affect my particular scenario – I was building an admin tool for a community manager to review images submitted by the users, and each image would only likely be viewed once (during the actual review) by that one person – but this may not be a good approach for a public facing site getting lots of visits. Some of the articles I was reading suggested using this technique for very small images – images where the amount of data being sent is so small that it makes it more cost effective to just send the data down with the rest of the markup and save an additional request to the server. With larger images, like photos, it probably makes more sense to map a unique URI to each image so the browser (or a CDN) can cache it. At any rate, while this was not new for the web in general, it was new to me and I was so impressed with how easy this feature made my job that day that I wanted to share.